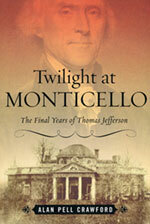 Based on new archival research and hitherto unexamined documents from special collections across the country, Twilight at Monticello: The Final Years of Thomas Jefferson, published by Random House in January 2008, offers a poignant and unforgettable look at Thomas Jefferson in the nearly 20 years of his life that followed his presidency. Drawing on the correspondence of Jefferson’s children, grandchildren, distant relatives and Monticello neighbors, the book examines in vivid detail the struggles this iconic Founding Father faced in his retirement years—his chaotic and sometimes violent family life, his mounting personal debts, and his evolving yet contradictory views on race and slavery. It was during these years—from his return to Monticello in 1809 after two terms as president until his death in 1826—that Jefferson’s idealism would be most severely, and heartbreakingly, tested.